Mario and Luigi rush to Bowser's Castle to rescue Princess Peach once again, but they are met by Count Bleck, a powerful dark wizard who kidnaps Luigi and Bowser, then hypnotises Peach and Bowser into marrying each other, unleashing the Chaos Heart. Bleck uses the Chaos Heart to create an expanding void in dimensions that threatens to destroy the entire universe. Mario is joined by a Pixl named Tippi and has to find the eight Pure Hearts to banish the Chaos Heart and restore the dimensions. 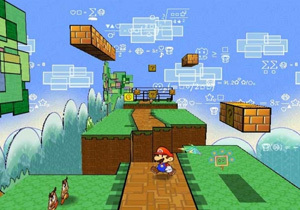 Mario can flip the action from a 2D to a 3D perspective to find hidden items and pathways. As the game progresses, Mario finds more Pixls and companions, giving him new abilities. When Fracktail begins to malfunction, its eye changes into a blue ring with a small blue ball rotating around it. This is the "loading" icon for the Wii Shop Channel. Shortly before the fight begins, Fracktail says "I am Error!". This was first said by the character named Error in Zelda II: Adventure of Link, and later became a popular internet meme. In the Japanese version, Fracktail says "Please Insert Side B". This is a reference to one of the common messages that appeared on the Famicom Disk System when you needed to switch disk sides. In Saffron's house you can find a wall-mounted Nintendo DS used to keep track of recipes. It is referred to as the "Dining Specializer". In the Flopside Milk Shop, flip the screen to find two treasure chests. One of them contains Cooking Disk B, meant for the Dining Specializer, and shaped like a Nintendo DS cartridge. Francis is a large chameleon and a massive geek who has kidnapped (or "collected") Princess Peach. On stage 3-4, you have to infiltrate his fort, which is filled with strange items, and includes many Nintendo references. If you flip to 3D mode, you can also see a Wii hooked up to a flat screen TV. In the games room, there are also loads of dolls, mostly characters from Paper Mario and Paper Mario: The Thousand-Year Door. On the walls are posters of Lady Bow (PM) and Petuni, and you can also find a radio controller Professor Frankly (from PM:TTYD). When Francis is talking to Peach later on, in his inventory he is holding "Cyborg Wart" and "Rare Candy Collection" (which may be a reference to the Rare Candy items in Pokémon). Throughout the game, references are made to TV shows about the X-Nauts and "The Grodus Chronicles", referring to the antagonists in Paper Mario: The Thousand-Year Door. When Mario, Peach or Bowser collects a Mega Star, they will transform into a giant, 8-bit version of their sprite from Super Mario Bros.
On stage 3-1, an enemy Koopa Troopa grabs a Mega Star and transforms into an 8-bit Koopa Troopa, also from Super Mario Bros. The Pal Pill appears as three 8-bit Mario heads from Super Mario Bros. When you collect it, you are surrounded by tiny 8-bit versions of your current character who will take damage and help you to attack enemies. The Shell Shock is an 8-bit green Koopa Shell from Super Mario Bros. When you use it, you have to play a minigame that may make the shell grow up to three times its original size, increasing the amount of damage it will do. In stage 3-1, jump between the two red pipes and you fall into a Paper Mario style version of World 1-2 from Super Mario Bros.
"This is where people go when their game is over; some call it World -1." This refers to the infamous Minus World glitch from Super Mario Bros., where the world number would be displayed as -1. In Chapter 7-2, complete Dorguy the 2nd's quiz with 100% and he'll say that your brain age must be pretty low, referring to the DS education software Brain Age: Train Your Brain in Minutes a Day! The Pit of 100 Trials takes place inside what appears to be a large Game & Watch, with flat LCD graphics that change to affect the layout on each of the 100 stages. In Chapter 7-2, you have to fight the Underchomp, a three-headed Chain Chomp. However, you have to fight the Underchomp in an RPG style against a black backround, choosing your moves and items in order to affect the most damage. It has been suggested that this could be a reference to Enix's Dragon Quest series or Nintendo's Mother series, and the fact the Underchomp is weak to sound-based attacks definitely suggests inspiration has been taken from the latter. During the Piccolo sidequest, you have to collect the Training Equipment for Merluvlee by trading the "You-Know-What" with Bestovius. The Training Equipment is actually a Nintendo DS. Bestovius says she can have it because he has upgraded to the newer, sleeker model. After giving Merluvlee the Training Equipment, you ask what she's training and she replies "Why, my brain, of course!" Another reference to Brain Age. Whenever you use Piccolo's power, the sound effects made by your character will change into 8-bit sound effects from Super Mario Bros. In Flopside, Merlee will offer to charm you in exchange for Coins. When you accept, she shouts "WIIIIII!" as she casts the spell. For every 10 stages you clear in the Flopside Pit of 100 Trials, you receive a catch card. The last eight of these are cards of your partners from Paper Mario. After restoring the Sammer world, return and beat all 100 Sammer Guys and you will receive Catch Cards for Mario's partners in Paper Mario: The Thousand-Year Door. "Lakitu chucks Spinys like coins at a Pianta Parlor. What's its problem? Someone made fun of its glasses." The Pianta Parlor was a minigame casino in Paper Mario: The Thousand-Year Door. One is shown in First Person. Using the gun, you have to shoot down all the ghosts in the foyer of Luigi's Mansion. In the game where you hit Striker Koopa shells, the background seems to be a Game & Watch style LCD version of Super Mario Bros.
4. Squatting Birdo Birdo from Super Mario Bros. 2. 7. Shoe of Kuribo the Goomba's Shoe item from Super Mario Bros. 3, which was named "Kuribo's Shoe" in the manual. 19. Another Castle Toad's phrase "Thank you Mario! But our Princess is in another castle!" from Super Mario Bros.
22. Thousand-Year Roar Paper Mario: The Thousand-Year Door. 42. Furious Fang of Goomb Goomba from Super Mario Bros.
52. Hammer Uncle Hammer Bros.
58. Over the Flagpole A glitch that allowed you to jump over the Flagpole in Super Mario Bros.
67. Mustard of Doom One of the phrases said by Fawful from Mario & Luigi: Superstar Saga. 78. Infinite Jump Possibly after the Staircase trick in Super Mario Bros. where you could earn unlimited 1UPs by endlessly bouncing on a Koopa Shell. 81. Smiling Cloud The smiling clouds from Super Mario Bros.
83. Block of Pow POW Block from Mario Bros.